Apple to release new AirPods, HomePod, over-ear headphones in 2019? | What Hi-Fi? Are there some Apple firsts on the horizon? Once an Apple product has been launched, it’s rarely longer than a week before rumours of a sequel start circulating the internet. It was no different for Apple’s HomePod smart speaker and 2016's AirPods true wireless buds, but now it seems we have some details of the next-gen products as well as a rough idea of when we’ll see them on shelves. Higher-end AirPods and a new HomePod could arrive alongside a pair of over-ear headphones next year, according to Bloomberg sources. 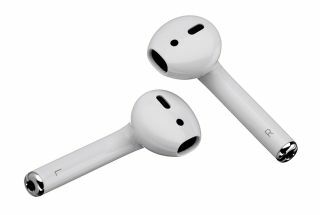 The AirPods will supposedly sport a noise-cancelling and water-resistant design, and cost more than the existing pair (which were £160 at launch). The sources also suggest they'll feature a new chip, Siri voice activation and (like the Apple Watch) perhaps even sensors for a heart-rate monitor. There’s seemingly no hot-off-the-press specs on a next-gen HomePod, but previous rumours have pointed to a smaller and cheaper version in the near future. The likes of Bose, Sennheiser and B&W may want to keep an eye on Apple’s forthcoming offerings, too, as another rumour has it the tech giant will also release its first-ever pair of over-ear headphones to sit above its Beats-branded offerings. Earlier this year KGI Analyst Ming-Chi Kuo reported Apple is developing its own brand of high-end, over-ear cans for launch this year. However, Bloomberg’s sources reportedly said that while they were due for launch this year, ‘development challenges’ has seen them be pushed back to 2019.